I’ve mentioned before that one of my favorite books is Fred Marcellino’s Puss in Boots, whose cover graces my computer screen. I recently came across one of the most famous portrayals of the iconic cat character. Gustave Doré’s wonderful engravings were done for an 1883 edition of Charles Perrault’s 17th century classic. (Interesting fact: Perrault was the brother of the designer of the façade of the Louvre!) Apparently the story of the courageous, crafty and clever cat who defeats a horrible ogre was written by Perrault as a parody of the musketeer stories of his time. Illustrators have long enjoyed creating new versions of the brave cat, but still stay rather close to the Doré version – the tall cavalier boots, the plumed hat, the insouciant look. 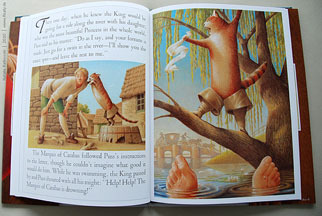 An illustrator faces a great challenge when re-envisioning a familiar, much-loved, classic literary character. The excellent interpretations of Fred Marcellino, and the delightful animated version in Shrek 2, are distinctive in their own way while still bringing Doré’s early version to mind. On tomorrow’s post I’ll show several sketches I recently finished as an exercise, showing my attempts to address the problem faced by the Puss in Boots illustrators. As I sketched I attempted to depict another iconic figure – the heroine of Johanna Spyri’s Heidi.